Goblin spiders are generally tiny, some with hardened plates (scuta) on their abdomens that operate like a bivalve bellows, expanding when conditions are moist, contracting shut in dry times to conserve moisture. 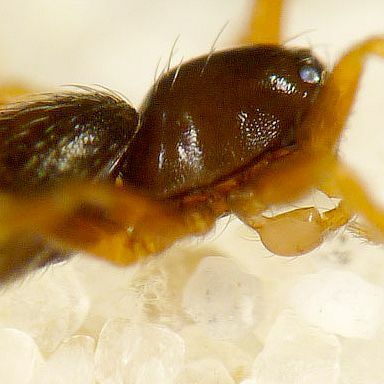 Oonopids usually have six eyes, the anterior median eyes having been lost. They are usually found in the litter layer and under rocks but they also live in the canopy of tropical rain forests. Oonopids occur as fossils in more amber deposits than any other spider family, probably because of their widespread distribution, small size and wandering behaviour. The Australian Oonopids are being revised by Barbara Baehr and others, as part of a large-scale review of the genus associated with a global review of the family Oonopidae. Male Cavisternum spp. are recognized by a concave sternum, as the generic name suggests. They also have elongated fangs with broadened tips. This small elongated Opopaea is common under bark in Lamington National Park.